Unilever has unveiled the latest addition to its Streets Heart Brand portfolio, the Streets Splice Real Fruit icy pole. The new icy poles have a fruit juice content of around 40%, and are available in strawberry and orange flavours. Both new icy poles contain fruit inclusions – orange pulp and strawberry seeds – to emphasise the ‘real fruit you can actually see’, and are targeted at a more health-conscious demographic, including parents. Each icy pole also clocks in at less than 75kCal and is free of artificial colours and flavours. Streets Splice Real Fruit are available individually at petrol stations and convenience stores around Australia at a RRP of $2. 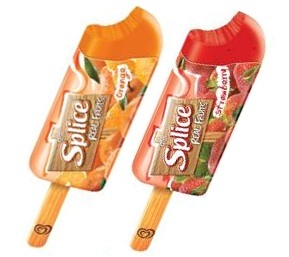 Why on earth would they have these new fantastic Splice Real Fruit Icy Poles available ONLY at Servo’s and convenience stores???…. They should have them in packs available at Woolies and Coles and Aldi!…..there’s a real market out there for them atm!. TASTE UNBELIEVEABLE!